But before we get to that...remember The Train's Off The Track? Well as a treat, here's Melbourne singer and choir director Stephanie Payne's take on it. How cool is that? Darlings, in December last year my choir Voices in The Wilderness, performed the Banchieri. It was WONDERFUL. If you've been reading for a while, you may recall the various posts of my translations. The work has twenty songs and they range in difficulty from very easy to extremely ambitious indeed for a community choir. To perform this work - we gave the five most difficult pieces to dedicated smaller ensembles within our choir who put in an admirable effort to get the pieces up. I've listed the pieces together at the bottom of this page, with links to their sheet music, in order of difficulty - so your choir can make a selection based on your own needs. I can't tell you enough how well it went, how beautifully the choir did, how much fun it was for audience, singers and guest musicians. Here's an excerpt from the program - which explains a bit more about the work. Welcome. Thank you for joining us for this treat. I am in love with the music of this work. The harmonic language sounds so fresh and new to my ears - just thrilling. What a piece of music. It's raucous and rowdy and cheeky and beautiful. The text ranges from the most sublime love poetry, to a canon of ridiculous animal noises. The whole work is a romp of joyful silliness mixed with stunning choral writing. It's also written for (but rarely performed by) community singers. So this is the authentic deal. We will be performing it on the instruments it was composed for! And you can hear it. The earthiness, the lustiness, the robust singing of a joyous community choir bring this work to life. I hope you like the translation. This will be a premiere of my English text. A special thank you to Bethany Hill who lent her early music expertise to our preparation work. I would like to express my immense gratitude to all the singers of Voices, who have thrown themselves into the preparations for this work with creativity, determination and joy. 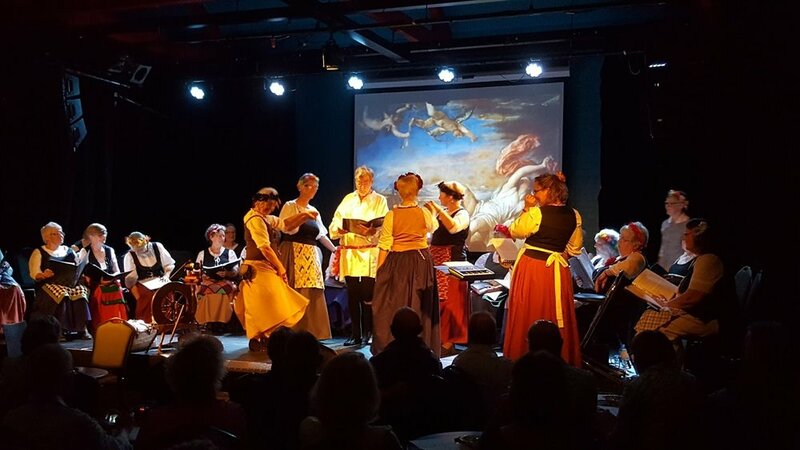 Adelaide Choir Voices in the Wilderness presents the magic and nonsense of this wonderful renaissance piece by Bolognan Monk Adriano Banchieri with English text written for the occasion by Jodie O'Regan. The work is a collection of madrigals, woven together with commentary and interjections from the ridiculous character Modern Pleasure. 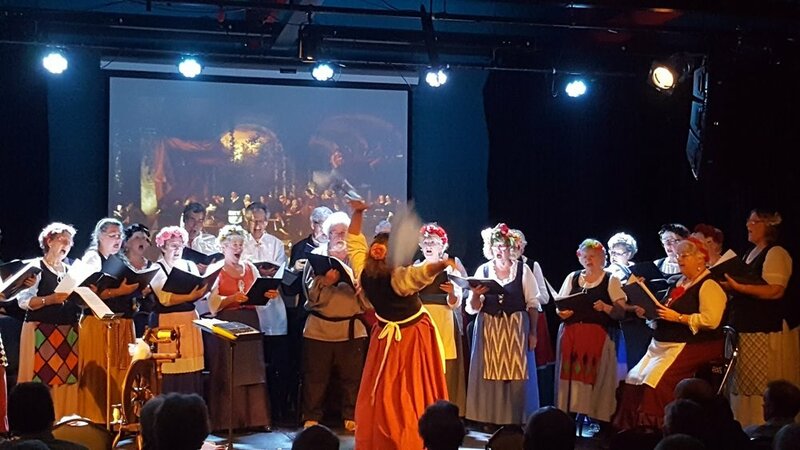 Musical guests Ray Smith and Kerryn Schofield join us on period instruments and our own vocal quartet Time Sweetened Honey will open the concert with some Elizabethan hits. Madrigal comedies come from late renaissance Italy and draw on the characters and ideas of commedia dell'arte. They were written to be sung but not fully dramatised. They are playful, theatrical and raucous. There were only about two dozen ever composed - evolution favoured the rise of opera! So this piece holds a special little spot in musical history. 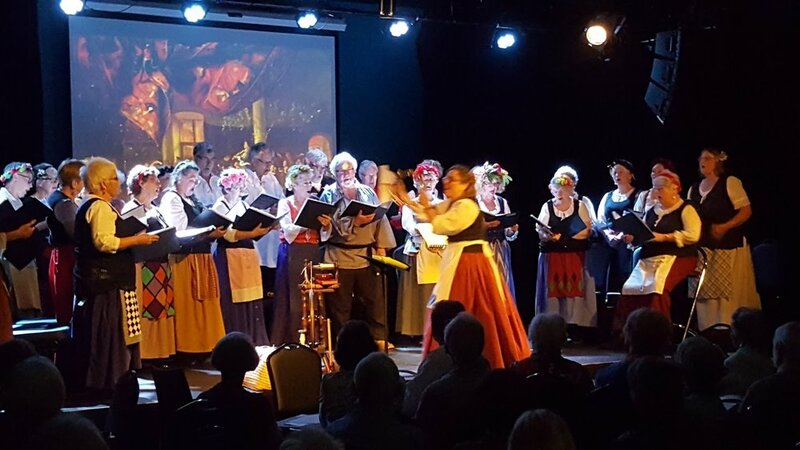 Voices in the Wilderness is an irrepressible and adventurous Adelaide Choir whose previous concerts range from Vivaldi's Gloria to debuting a Children's Cantata of Beatrix Potter's Tailor of Gloucester to performing Appalachian songs at Wirrina's Bluegrass and Roots Festival. Here are the songs. I would recommend the work for any choir. You could do the whole work, or get some imported quartets/quintets to handle the trickiest songs, or present a bracket of the easier ones within a concert. Just have a look! Click on each song to open the sheet music. And lastly some photos from the show. We had a brilliant narrator in Roger. It may be that there's a wonderful translation of the commentary online that ties the work together. But I couldn't find a public domain one, so I couldn't possibly share a link here. We didn't stage this. But as you'll see, we had some dramatic elements. Ela spun wool during the spindle seller songs, we had dancers to dance the spindle, the lovers hammed it up wonderfully. We had magnificent renaissance musicians who stood outside the venue and piped the audience in. It was great.